I love to stress the fact that you don’t have to wash your hair everyday. A good blowout can last 3-5 days, sometimes longer, depending on your hair texture. Dry shampoo is the perfect product to help keep your blowout looking fresh. 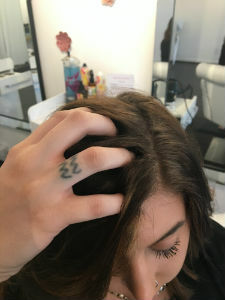 Dry shampoo is meant to be sprayed just on your roots, not all over your hair. I suggest that you spray dry shampoo on your roots before you go to bed at night. This will absorb oils that your scalp may produce over night, or if you sweat when you sleep. I call it preventative maintenance – why wait until there’s a problem when you can prevent it. Catch the oily roots before they happen. You can also use it in the morning to freshen up your blowout and keep your roots looking fresh and clean. Whether you use dry shampoo at night or in the morning follow these 3 steps to get the best results. Step 1) Start where you part your hair and take small sections. Lift your hair straight up off your head. Spray. Continue this all over your head spraying just your roots. 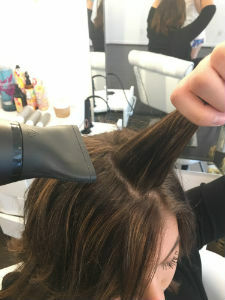 Step 3) To get a little extra lift you can add heat to your roots with your blow dryer. 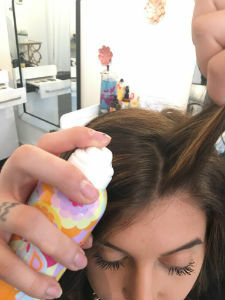 It’s pretty easy, and now you know the right way to apply dry shampoo. Hope this helps you have a great hair day everyday!